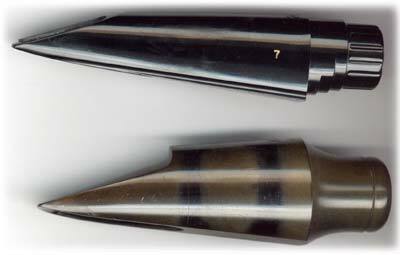 The mouthpieces pictured on this page are the ones that I use on my Buescher bass. The fatter one on the right is a vintage Geo Bundy bass sax mouthpiece. I am able to use the same baritone sax reeds on both of them. The modified bari piece (pictured at the top of the photo above) has more volume and projection than the bass mouthpiece. As far as sound goes, the stock bass piece has a more classical tone, whereas the Runyon has more of an edgy tone, better suited to jazz music. 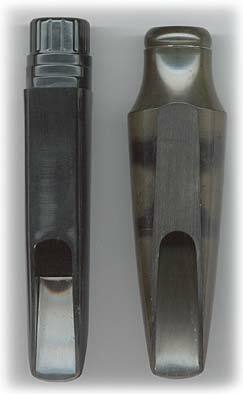 Both mouthpieces respond equally well in all registers. Intonation is equal on both. Paul Coats has done considerable research on mouthpieces and reeds for these quirky horns. Paul’s mouthpiece page contains photos and information that Paul has provided about the modifications to the Runyon Model 88 bari mouthpiece. If you’d like to talk to Paul about working on your mouthpiece, or buying a customized Runyon Model 88, just drop him an email. He is very knowledgeable, and his workmanship is very good. His prices are also reasonable.